Logistics, handling and palletisation in the pasta production process. SIR spa’s experience and strategic vision in a clear example of the vertical application of robotics. Palletisation and logistics operations have been performed automatically in most food industry production sectors for some years now: the difficulty in achieving the global automation of the various procedures lies above all in the complexity of the operations, and the flexibility needed to adapt to the continuous lot changes of modern industrial production processes, where the constant reduction of inventories and customisation of load units are crucial. Another factor is the variability of products, often subdivided into dozens of families and models. Therefore, the development of customised robotic automation solutions in end-of-line handling and logistics does not only require the application of complex technological factors: corporate strategies are equally important. Robotics acquire global significance, combining with the broader problems of organising flows in order to cut costs, provide more efficient storage and rationalise the use of space. 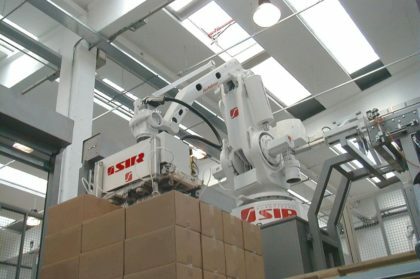 The systems built by SIR Soluzioni Industriali Robotizzate (Modena), one of the leading international system integrators, are inspired by this new philosophy of automation, and are also designed to perform material handling processes with the sole use of articulated robots, in operations often traditionally performed by SCARA or Cartesian systems in the food & beverage industry. These systems can also be combined with the laser-guided vehicles (LGVs) produced by SIR sister company SITI B&T Group, used for transporting materials within production plants. With the aid of this synergy, SIR is not only able to cover the usual transport and palletisation operations, but can also create lines that bring together applications from all fields of industrial automation: from checks on the dimensions and correct forming of the load units to devices for channelling and distributing logistics flows, and from loading/unloading robots to gripper systems specifically designed for the different types of product. The implementation of customised solutions with high value-added, where the degree of integration between manipulators, instruments and accessory devices becomes extremely high, allows the automation of exceptionally complex operating sequences. 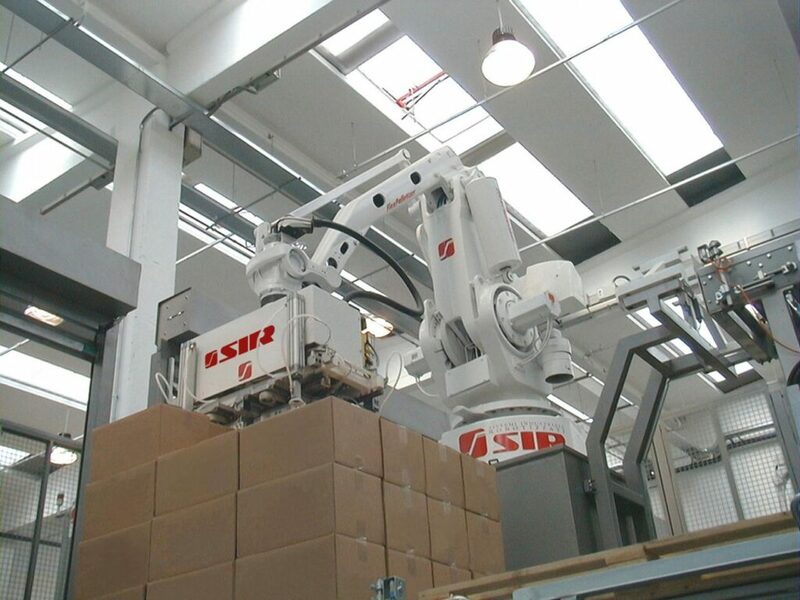 SIR has already installed a large number of automatic factories, aware that this new concept of robologistics (automation adopted throughout the product’s logistic flow) will be essential in enabling firms to ensure their competitiveness on the global market. 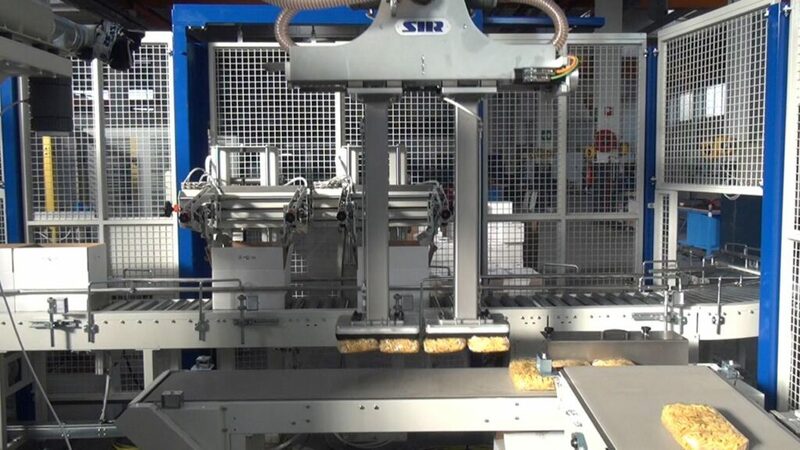 Amongst SIR’s many installations, the complete automation of the production flow of a large pasta producer is particularly important: the system uses a complex combination of conveyor belts and roller ways for handling cartons, bags or bundles of pasta leaving the packaging lines. 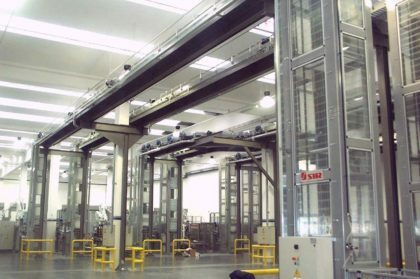 Also installed are elevators and descending conveyors that distribute output to the correct lines, and a large number of parallel systems equipped with 4-axis articulated robots for palletising the packaging units. Initially, the conveyor belts guide the load units towards the inspection systems which check that the cartons are properly formed. The units are then raised to a height of 5 metres by special vertical elevators, which allow the pasta to be transported without unnecessary occupation of the plant’s floor area, used for storage purposes. The roller ways, a few hundred metres long, act as accumulators of material to ensure a constant flow to the end-of-line bays. At the other end of the plant, special descending conveyors return the packs of pasta to ground level, ready for final palletisation. Each robot in the line-end bays is equipped with custom-designed grippers, allowing it to handle two pieces at once and deposit them in accordance with the correct palletisation layout, with obvious benefits in terms of space occupied and load stability. Each bay can tend several pallets, depending on the product code currently arriving on the delivery channel. The palletisation layouts and consequent handling strategies are managed by means of a centralised software program, which also serves as supervisor for the entire plant during both normal cycles and lot changes. 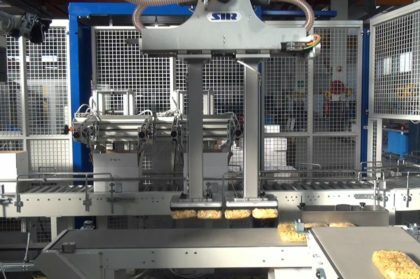 The SIR-built line also includes the handling of bags of pasta for insertion in special carton boxes, with the aid of special forks which can be automatically fitted when the lot changes thanks to quick end-effector connection/release modules. The empty pallets, carton boxes and cardboard tier sheets are supplied by means of rail-mounted shuttles which collect the components from the loading bays and automatically distributes them through the plant. The loads leaving the robotic systems are finally channelled towards the film wrapping machine and then collected by a fleet of LGVs. These laser-guided shuttles are able to transport the load units and store them in an automatic warehouse, with the aid of special management software that coordinates the heavy traffic of calls and missions. Modern and attractive in design, the LGVs that SIR offers feature impressive structural and performance characteristics and an extremely user-friendly user interface. Painstaking optimisation of design parameters to achieve maximum flexibility makes these vehicles the link between the automatic factory’s individual production phases and the ideal tool for simple, computerised storage management. The automation described above has generated amazing results, with total cycle times around 60 packs a minute, with exceptionally high efficiency. 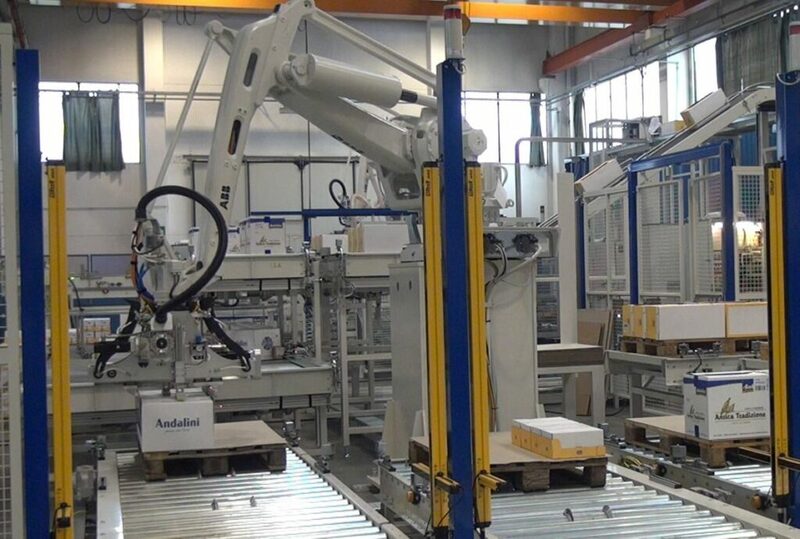 Expected to recoup the relative investment within just a few years, the lines are thus capable of handling more than 20,000 packs per shift with the aid of latest-generation 4-axis articulated robots, specifically designed for high-speed palletisation. 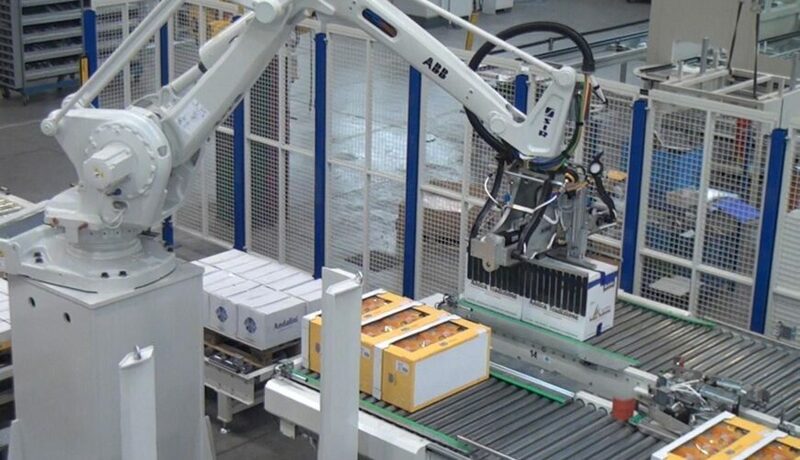 This astonishing achievement clearly proves that robologistics are the crucial factor for modern food & beverage industry firms with very high production rates. So the robologistics approach is well suited to large organisations, although we must never forget that extreme flexibility is also required due to the very wide variety of products. For example, the whole of the line described above is able to retool itself in just a few seconds when the lot changes, through procedures which replace the end effectors and the functional components of the specific machines. This is all controlled by robust supervision software, the real brain of the system, able to synchronise this great robomatic chain like an orchestral conductor and allow robots and vehicles to become the protagonists in a new philosophy of automation. The implementation of such large, complex plants generally requires not only multisectorial know-how but also considerable work to coordinate the different subcontractors called in to deliver its various parts. A large number of components and items of equipment have to be conceived, designed, built and put into operation in integration to achieve the result required. The role of the system integrator thus becomes fundamental in delivering a global solution that provides the single operation unit with real value-added. The vast body of knowledge SIR has built up in 25 years of high-level robotics, applied in different industrial sectors and automating operations of all kinds, enables it to satisfy the customer’s specific needs and open the way to the spread of robofacturing.